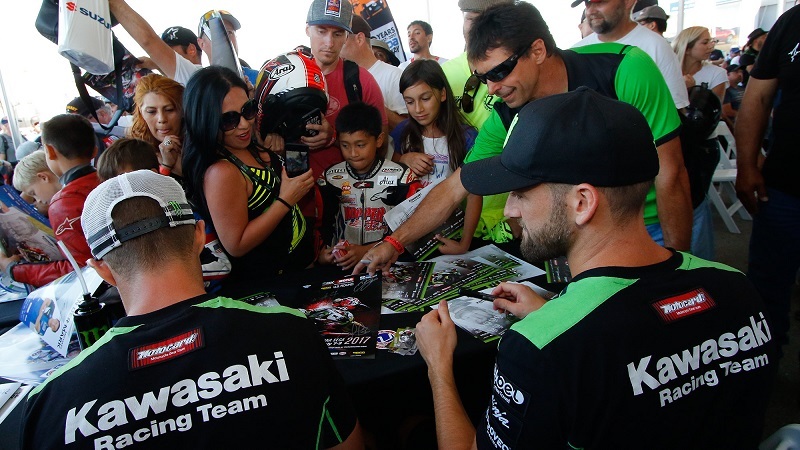 Rolling into the legendary WeatherTech Raceway Laguna Seca this weekend, the MOTUL FIM Superbike World Championship is preparing for a sensational round eight of the season and fans are guaranteed to have a stunning weekend trackside. With all tickets offering free paddock access, as well as open grandstand seating, every side is covered for the GEICO US Round. Welcoming the Paddock Show stage to the Californian circuit, it will be bigger and better than ever before this weekend as it offers American fans the new format which is bound to go down a storm. Each session will be shown live on stage, with commentary and special guests throughout the weekend. But this is only the tip of the iceberg, as a whole host of chat shows will light up the stage on Friday, before the Opening Day Show ends proceedings with the fastest three, top independent and all American riders. Saturday at the Paddock Show stage will light up the paddock, as Americans are introduced to the all new Race Shows which allows fans to hear from riders just minutes after the Prosecco DOC is sprayed on the podium. With the help of the SuperShow after all on track action has finished, you will be able to see all WorldSBK riders on stage to end Saturday, before the Party in the Paddock rounds out the day. Sunday will provide plenty of on stage entertainment with Race Podium Shows taking over the schedule, but offering the most exclusive chats. It won’t be an area to miss. Ahead of seeing your favourite riders out on track, why not head to the Marketplace which is open from Friday onwards and offers your chance to buy merchandise for your favourite riders. On top of this there will be expositions and product displays to keep you entertained. Or you could head to Ducati Island for their pure Ducati experience from Friday to Sunday, which will offer demos, live entertainment and the chance to see the Ducati WorldSBK riders. If fans have ever dreamt of riding around the 3.6km of stunning tarmac with their own bikes, then this weekend is the chance for their dreams to come true. On Saturday lunchtime, there will be a unique opportunity on offer for fans to take to the track with their own bike, as well as a passenger. Requiring a ticket, this is too good of an opportunity to miss. If the racing action on track got your heart pumping, then the circuit have the perfect solution for you to let out your adrenaline with a go-kart track right in the paddock. Open from Friday right through to Sunday, it offers the chance to put your skills to the test right in the heart of the track. If you’re missing out on being trackside, or aren’t opting to camp at the circuit which provides first class views of the stunning circuit, then ensure you are enjoying SBK® somewhere just as sensational!